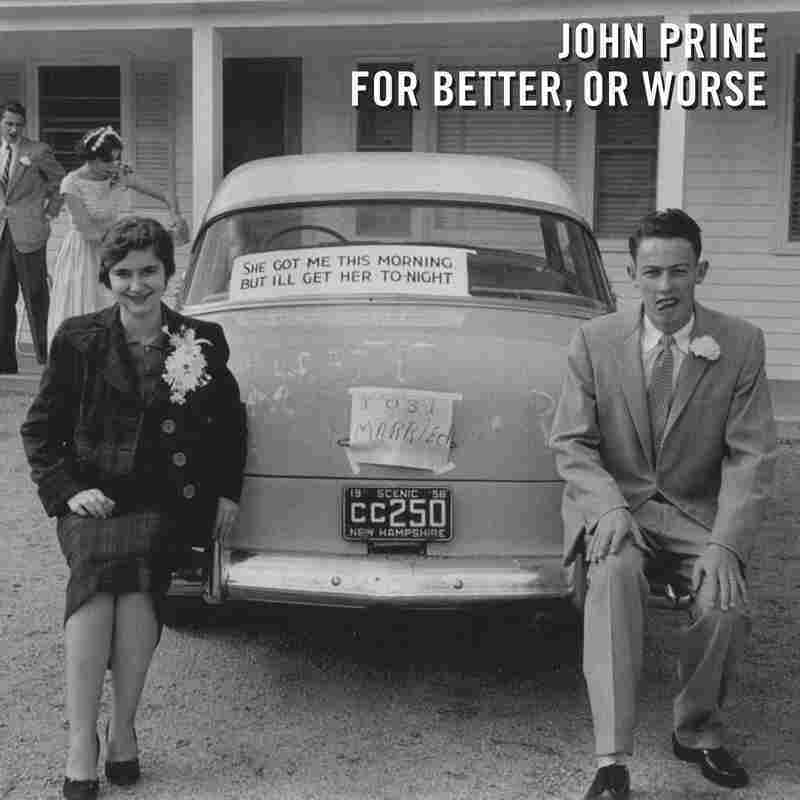 John Prine To Release New Duets Album, 'For Better, Or Worse' : The Record The sequel to 1999's album of vintage country duets, In Spite Of Ourselves, will be out Sept. 30. Hear Prine sing the opening song, "Who's Gonna Take The Garbage Out," with Iris DeMent. For much of the post-Dylan age, and particularly in such self-consciously cerebral genres as indie rock, contemporary folk and Americana, artists have been more likely to command critical respect for cultivating their songwriting voices than for interpreting songs from others' pens. But John Prine, who was once pegged as a new Dylan, seems to be having a fine time toying with that modern musical hierarchy. The profoundly human characters, lived-in wisdom and wry turns of phrase in his songs have earned his spot in the Nashville Songwriters Hall of Fame many times over, but most of his releases over the past decade and a half have spotlighted what he can do with his congenially craggy, latter-day singing voice when he applies it to the compositions of his younger self, or places it next to a genteel southern crooner like Mac Wiseman or some of the finest women singers the country and roots scenes have to offer. Prine put out his first beguiling batch of coed country duets, In Spite of Ourselves, in 1999, and part two, For Better, Or Worse (out Sept. 30 on Oh Boy Records), is now on the way. He jokes that he was "kinda tricked" into recording it. "My wife is my manager now, and my son runs the record company," he explains on the phone. "They told me they were putting out a vinyl version of In Spite of Ourselves, and they'd have to use two records to get all of the songs on, so there'd be an empty fourth side. So if I could go record five or six new duet songs for the bonus tracks, that would be perfect. So I went and did five and said, 'Here you go.' They said, 'Why don't you do another eight or nine? You'd have a new record.' So I got tricked into it, but I'm glad." Soon he's reaching for even more potent words to describe his enjoyment of the process: "When you're singing somebody else's songs, it's just pure joy to me." Prine's singing partners this time around include the likes of Miranda Lambert, Kacey Musgraves, Lee Ann Womack and Kathy Mattea. The only holdovers from the first go-round are his wife Fiona and his old friend Iris DeMent. He and DeMent were so well-matched as a bantering, grudgingly tender couple in "In Spite of Ourselves" that it's a real pleasure to hear them inhabit similar roles in the classic country two-step "Who's Gonna Take The Garbage Out," her needling, scrappy wife and his fumbling, stubborn husband conjuring profoundly frayed patience. Prine filled NPR in on what he gets out of taking on projects that revolve around singing, and how his songwriting fits into the picture. Jewly Hight: I was pleased to hear that you have a new album on the way. John Prine: Oh yeah. We're working back-to-back here. We've got duet things going and I'm working on another John Prine record. I've heard Iris DeMent sing all kinds of songs, usually very sincere and moving songs, but I've never heard her sound more rascally or playful than she does when she sings with you. [chuckles] I know. I don't know this for sure, but I would bet money that Iris must've listened to a lot of early Loretta Lynn records when she was learning guitar and singing around the house. Because when I pitched this song to her, "Who's Gonna Take The Garbage Out," she knew it right away. And she has those nuances in her voice like Loretta Lynn, but she doesn't sound like Loretta. Iris sounds like nobody but Iris. I threw this song at her at the last minute. I originally pitched a different song to her, a different Loretta Lynn and Ernest Tubb song that we ended up doing later on the record ["Mr. & Mrs. Used to Be"]. Since she was staying at my house as a houseguest, I figured I'd see if I could get two songs out of her. I watched a video of Ernest Tubb and Loretta Lynn performing the song, and they couldn't help but grin and giggle a bit as they delivered their digs at each other. Right. I mean, the guy doesn't really have a big part in it. I just keep saying, "Well, who's gonna take the garbage out after I'm gone?" She gets to say all the parts running the guy down. It was the same way with "In Spite of Ourselves." You gave Iris the saltiest lines in that song too. Actually, when I wrote the song, I had Iris in mind and was hoping that she'd be able to do it. I kinda had her voice in mind when I was doing it, because I know Iris can be a little sassy and she could tear this guy down. I called and explained I was going to send [it to her]. I told Iris, "I want you to listen to this and just see. It's got a few questionable things in it that you're gonna have to say. So you just tell me whether you would want to do it or not. We'll leave it at that." So I didn't hear from her for three weeks. Nothing. Finally I called her and I said, "Iris?" And she said, "Yes?" I said, "Well?" And she said, "Not while my mother's alive!" Then she ended up doing it anyway. For Better, Or Worse is your second collection of coed country duets. After so much experience inhabiting characters that you created in your songwriting, what do these duet parts offer you? I just always loved hearing a man and a woman sing back and forth to each other. Particularly country songs, but I like some of the pop duets, and I even like in musicals where they're singing back and forth to each other and there's a storyline there, you know? But I think in country nothing gets more to the point, and you can also mix up some humor with it. Many of the songs that you chose for this album were not originally conceived of as duets, like "Dim Lights, Thick Smoke" for instance. By inviting Amanda Shires to sing it with you, you let the woman in that storyline talk back to the guy for the first time. Does it appeal to your writerly sensibilities to play with a song like that? I never realized on that song and also "Mental Cruelty" that I did with Kacey [Musgraves], it's all from the man's point of view. So I said to both Kacey and Amanda, "Why don't you put your own words in there and just sing it like it's your turn on the stand?" So they did. I think it worked out real good. I did notice that you gave some of your duet partners the first verse. That's true of one of the numbers you did with Kathy Mattea. Yeah, and Lee Ann Womack. I always gave them the choice of what verses they wanted. When I reached out to each of the artists, I'd give 'em maybe two songs and then say, "If neither of these do anything for ya, send me back a list of what you wanna do." I figured if they were into the whole deal of the country duets, they might have some better ideas than I did. Susan Tedeschi sent me back a George Jones song I'd never heard of before, and it worked out perfect for the two of us. The first time you did an album like this, you got some really fine, robust country singers, like Connie Smith, Melba Montgomery and Trisha Yearwood. Though it's mostly a different group of singers this time, you've assembled some fine voices again, supple voices like Lee Ann Womack's and Miranda Lambert's that frame your voice in delicate curlicues. Heck yeah. And Morgane Stapleton, geez. She showed up with stuff. On In Spite of Ourselves, I had a few more voices that'd been around for a while in country music, you know, Melba Montgomery and Connie Smith. I was trying to get everybody I could that was still recording. I tried on this one; I asked Loretta Lynn, but it turned out that she had her first record in 10 years coming out, so she wanted to do it, but she was a little busy doing press for that new record. And I asked Dolly Parton too, and she was in California supervising that movie that they did on her. So I just turned to the younger set and got some people whose voices I really like. What pleases you about putting together such contrasting vocal textures, your voice and voices like theirs? To me, most relationships seem to be a conversation. It's going back and forth when you talk about taking the garbage out or when you're discussing a serious subject. It's back and forth. That's what makes it a relationship. And when you put that to music and put a steel guitar behind it, it's like going to the bank and asking for a loan with a fiddle and a steel with ya — it'll give ya more power. A minute ago you mentioned your duet partner Kacey Musgraves, who's brought conversational singer-songwriter sensibilities back to mainstream country music. I know she's quite a fan of yours. I've seen the YouTube video of her serenading you with her song "John Prine." Watching it, it looked like you appreciated her wit. Most definitely. She's out there as a mainstream country artist and getting her way of doing things out there, and her humor. I mean there are certainly places where she would've had an easier time with that than mainstream country. But she seems to be doing well at it. When I first heard her song "John Prine," it made a lot of sense that she would be an admirer of your work. Right. I get that more and more these days. I think it's just because I've been around so long. She's not the first to write a song and name it for you. 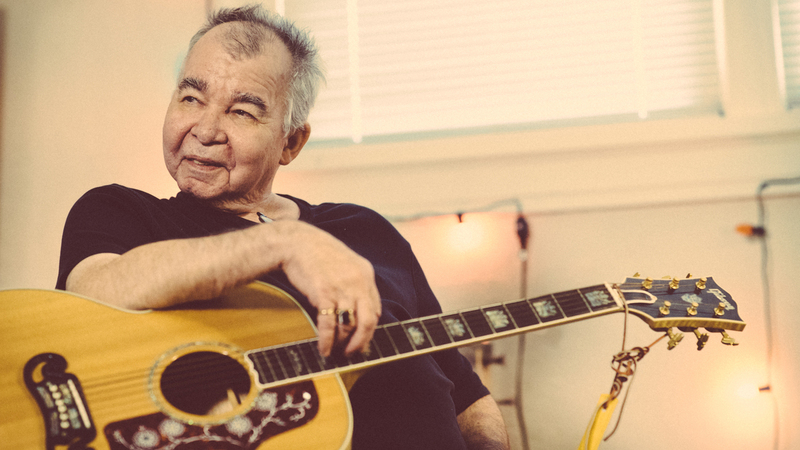 The indie rock band Low wrote a very different kind of song by the name of "John Prine." I didn't know what to make of that song. I thought it was a really cool-sounding track. I have no idea what I had to do with it. [chuckles] But I figured they must like me or they wouldn't have named the song after me. Do you really feel like you're just now seeing evidence of your influence on younger generations of music-makers? Yeah, I would say so. More so than before. I just kept my head down and kept moving along for years and years. I've been fortunate enough to always have plenty of work, offers to go out and play shows. The hardest thing I have to do is pick out which one I want. For some reason, there's a great demand out there, whether I've got a new record out or not. I'm writing for a record. It's been ten years, so I think it's about time I get one out. And I knew by putting this duet record out, it would trigger, like, "Okay, now where's your other record?" So I knew I had to get busy. I started writing on a new one a couple of years ago. The songs are coming but they're coming really slow. I could sit down with somebody and craft a song, and it would be a decent song, maybe even a good one. But I'd rather trust myself when I'm writing on my own. You've just gotta have a lot of patience, waiting for something good enough to write about. I developed a not-at-all serious theory that maybe you haven't been writing as much since you've been sharing your writing room with Sturgill Simpson because he's been hogging it. [laughs] Sturgill and me, since we've been sharing a writing room, neither one of us have been in town. I did a photo shoot over there the other day, and Sturgill wrote me from Sweden to tell me there ain't no meatloaf in Sweden. The room's got a huge pool table in it, a 10 foot pool table. I interviewed Sturgill in there, actually. Did you? Well where'd he put his drums? I saw a tiny drum kit in the back right corner. That's where the Christmas tree used to be. I had a year-round Christmas tree with nothing but colored vinyl 45s hanging on it, like old Elvis records and stuff. The tree looked so good that we moved it to my house. So I left a space there, and Sturgill brought his drums over, because he said they'd wake the baby up at the house. I don't think either of us have written anything in that room yet. Who knows? Maybe we'll get something done this winter. I think In Spite of Ourselves might've been the first album you made after you'd recovered from cancer treatment. Your singing voice had actually changed in range and texture, and you really embraced the change. Has that contributed to your enjoyment of singing projects like this? Yeah, actually it has. It was always difficult for me to listen to my singing voice for the first 20 years or so. I mean, I really enjoyed singing, and I enjoyed doing live shows, but being in a recording studio and having to hear my voice played back to me would really drive me up the wall. And after my voice dropped some in tone from my surgery, it kinda was more relaxed. It was easier for me to listen to — not that I like sitting around listening to myself. It made it more tolerable to me. I think it's wonderful that you developed a new appreciation for your vocal instrument, and new ways of using it. And I'm glad that there's a new batch of originals on the way. Me too. That's what I keep telling myself. I've got about half of 'em. Usually when I sit down and write one or two it opens the door and the rest of 'em start coming in, but so far it's been a little bitty group, two songs I really like and then nothing for months. A waiting game is what it is.